You will be impressed by the number of shore excursions in St. Thomas, US Virgin Islands, when your cruise ship docks here! You will be thrilled to spend your day at the Coral World Ocean Park viewing the incredible marine life exhibits or you can just lounge on the white sands of Coki Point Beach. Other fantastic beach options include a day pass at the Marriott Morning Star Beach Resort or a trip to Magens Bay and Sapphire Beach where the swimming is fantastic. 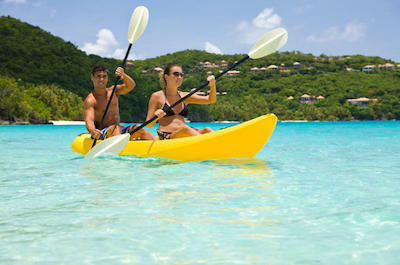 One of the more popular things to do in St. Thomas is to go swimming with sea turtles as well as open ocean kayaking. There are also cruise ship excursions that will take you shopping and to the summit of Mountain Top where you will be treated to panoramic views of the surrounding area. 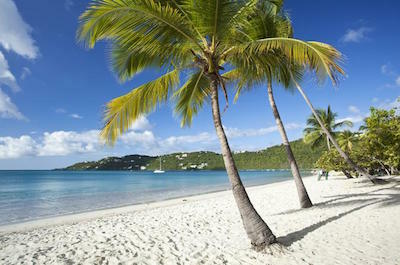 In the end, you and your family will be overjoyed spending the day on St. Thomas. When you are seeking a true wildlife encounter with plenty of beautiful scenery, then the best shore excursion in St. Thomas for you and your family is the Reef and Turtle Discovery Tour. Your 6-hour adventure begins with complimentary pickup service from your hotel/cruise ship port or when you meet your expert guide at Lindbergh Bay Beach where you will be fitted with all the necessary equipment for your excursion. From here you will travel by kayak for 1.5-miles or 45-minutes until you reach a pristine beach that is just off the coastline of the island. While you are traveling you will listen to expert commentary about the natural history of St. Thomas as well as learn how to navigate and paddle your kayak more efficiently. Once at the island you will make your way to a white sand beach and change into your snorkeling gear. 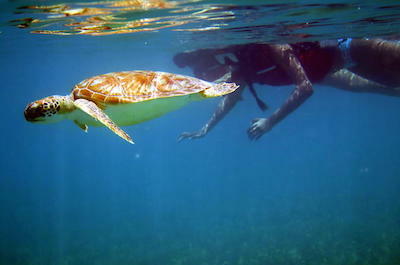 Then you will be able to swim and snorkel with the many sea turtles that are known to exist at this particular beach. 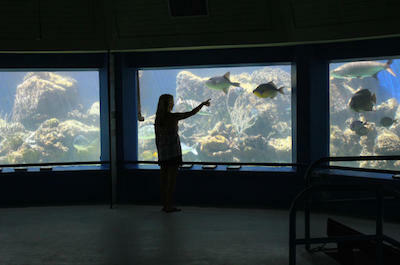 You will snorkel over coral reefs while viewing the interesting marine life as well as the numerous sea turtles. When you return to shore you will have time to relax on the beach and you can devour the free lunch that is served beachside. After you paddle back to Lindbergh Bay Beach your tour concludes or you will be taken to your selected hotel/cruise ship port of call. If you want as many activities as possible to enjoy while you are docked in St. Thomas, then the best shore excursion in St. Thomas for you is the Shopping, Sightseeing and Beach Tour. Your excursion has multiple start times and lasts between 3 to 5-hours based on the options you decide upon from adding more shopping time to spending the afternoon on a white sand beach. Your tour begins with complimentary pickup service from your cruise ship port where you will be transported to go shopping within the many duty-free stores in the historic Charlotte Amalie. You can add up to three hours of additional shopping time if you desire or spend an hour looking for your favorite souvenir. While you are shopping you can indulge in local cuisine and libations before you set out in an open air safari taxi. Once on board your safari taxi you will be transported to the summit of Mountain Top which is 1,547-feet above sea level where you will have fantastic views of St. Thomas as well as several other Virgin Islands. Other sights to behold from Mountain Top are Magens Bay and Blackbeard’s Castle. Now you can choose to end your tour here or you can continue by including a stop at Sapphire Beach, Magens Bay or Coki Point Beach. No matter which beach you choose you will be pleased with the quality of swimming, snorkeling and the beauty of the sugary white sand. Your full-day adventure concludes with drop-off service at your selected cruise ship port. If your family is searching for that personalized shore excursion in St. Thomas which includes kayaking as well as swimming with turtles, then you need to book the Kayak and Sea Turtle Snorkel with Beach Break tour. Your 4-hour excursion begins when you meet your expert guide at Lindbergh Bay Beach where you will be fitted with all the necessary equipment. From here you will receive expert guidance on how best to navigate and paddle your kayak while making your way to a small island off the southwestern coastline of St. Thomas. After a 1.5-mile or 45-minute paddle you will reach your destination at a picturesque white sand beach. While at the beach you can swim or snorkel with the numerous sea turtles that are known to habitat this area. Once you are finished with your water activities you can choose to lounge on the beach or you can order lunch from a beachside restaurant (extra cost). When you are finished with lunch you will kayak back to Lindbergh Bay Beach where your excursion concludes. When you are searching for a shore excursion in St. Thomas that is a combination of land and sea activities, then the Sea Turtle Snorkel and Nature Walk Tour is ideal for you and your family. Your 4-hour adventure begins with complimentary pickup service from your hotel or cruise ship port of call where you will meet your local guide. You will be transported to the west end of the island where you will board a ferry for a quick 10-minute cruise to a nearby island. While riding on the ferry you will listen to interesting commentary from your guide on the history and ecosystem of St. Thomas. Once at the island you will embark on a modest nature hike to a nearby white sand beach during which your guide will point out the important flowers and trees of the Virgin Islands. While you are at the beautiful beach, you will have plenty of time to go snorkeling or swimming as well as view the marine life including the magnificent sea turtles living in their natural habitat. When you are finished playing in the water you can lounge on the picturesque white sand and enjoy a free picnic lunch at a beach side restaurant. After you return to the mainland by ferry, your excursion concludes when you are transported back to your selected hotel or cruise ship port of call. When your cruise ship docks and you want to spend the day relaxing on the beach, the Marriott Morning Star Beach Resort Day Pass is the best shore excursion in St. Thomas for you. Your 7.5-hour adventure begins when you arrive at the Marriott Morning Star Beach Resort. Once at the resort you will have access to various amenities such as loungers on the private Morning Star Beach, the Morning Star swimming pool and you will receive a $40 bar credit towards any beverages you may want to consume. You can also enjoy other activities at the resort such as tennis, volleyball and a variety of beach games. Families like this option as an excursion because of the varied entertainment and watersports like swimming, snorkeling and jet skiing that can be enjoyed onsite. 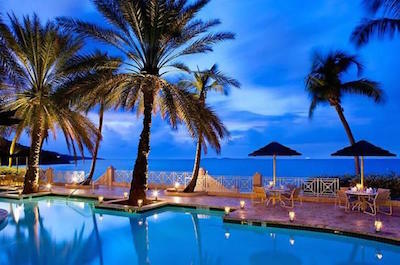 Once you have indulged in enough fun under the sun you can take a taxi back to your cruise ship port. When you want to view incredible marine life and have a little fun exercising, then the best shore excursion in St. Thomas for you is the Kayak and Sea turtle Snorkel excursion. Your 4-hour adventure starts with hotel/cruise port pickup service or when you meet your expert guide at the Lindbergh Bay Beach where you will be fitted with all the necessary equipment. Once in your kayak, your guide will give you instructions on how to navigate and paddle more efficiently. You will paddle for 1.5-miles or 45-minutes to a nice white sand beach where you can lounge as well as play in the water. 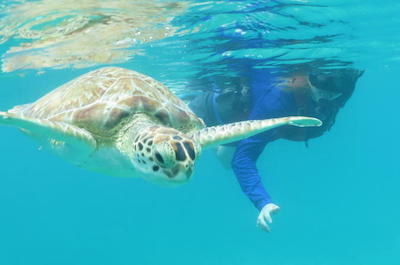 When you are swimming and snorkeling your guide will point out the colorful marine life including the many sea turtles that you are sure to see swimming in their natural habitat. If you need a break from the action you can always lounge on the beautiful beach. Once you are hungry you can eat a complimentary lunch at a local beach side restaurant. Your excursion concludes when you paddle back to Lindbergh Bay Beach or with drop-off service at your hotel/cruise ship port. 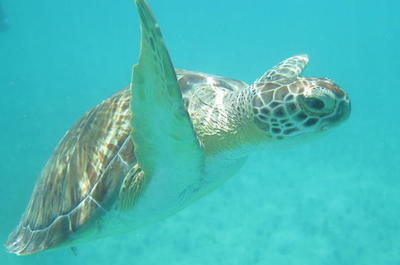 When you are searching for a shore excursion in St. Thomas that combines snorkeling, walking and kayaking, then the St. Thomas Sea Turtle Snorkel Adventure Tour is ideal for you. 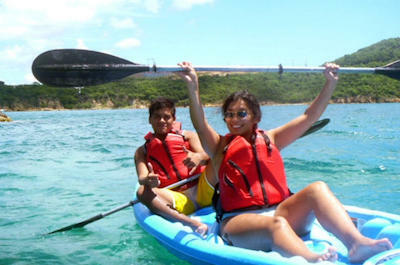 This tour is available in two formats which are walking and snorkeling or kayaking and snorkeling. Your 4-hour kayaking excursion begins when you meet your qualified guide at Lindbergh Bay Beach where you will be outfitted with a kayak. You will kayak approximately 1.5-miles or 45-minutes while you listen to your guide explain the natural history of the Virgin Islands. If you choose to do the walking portion then you will meet your guide at Crown Bay Marina where you will then take a short boat ride and after arriving at shore you will take a short walk with your guide. Whether you are kayaking or walking your ultimate destination will be a beautiful beach where you will have plenty of time to swim with sea turtles and view the incredible colorful underwater world of the Caribbean Sea. After you are finished swimming and snorkeling with the sea turtles, you can indulge in a complimentary lunch on the beach. Your excellent snorkeling with the sea turtles adventure concludes with a short boat ride or by kayaking back to your original starting location. If you have always wanted to explore the underwater world of the Caribbean, then the best shore excursion in St. Thomas for you is a Snuba Adventure at Coral World Ocean Park. Your snuba adventure begins when you take a short taxi ride from your cruise ship port to the Coral World Ocean Park which is located at Coki Beach where you will meet your expert snuba guide. Your guide will give you a brief orientation on the snuba equipment and tour before you enter the colorful underwater world. As you enter the water you will be amazed at the experience that was once only available to certified scuba divers. You will cruise through the underwater world amongst the brightly colored coral and tropical fish on your 30-minute adventure. An added bonus on this tour is admission to Coral World Ocean Park which features several fascinating exhibits that allow you to pet a shark to feed sea turtles to lounge on a white sand beach. Please give yourself plenty of time to explore the marine park before and after your exciting snuba adventure. Your excursion concludes when you take a short taxi ride back to your selected cruise ship port. When you want to go exploring on your shore excursion in St. Thomas, then one of the best adventures is the Hassel Island Kayak, Hike and Snorkel Tour. 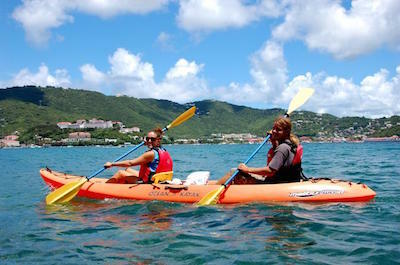 Your 3-hour excursion has two departure times throughout the day and begins when you meet your expert guide at the Frenchtown Marina in Charlotte Amalie Harbor where you will then kayak 20-minutes to Hassel Island. 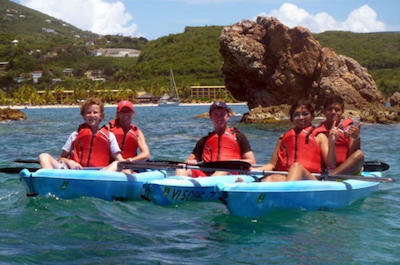 While you paddle you can enjoy the sights of Charlotte Amalie as well as other parts of St. Thomas before going ashore at the Garrison House. Here you will take a 10-minute hike to Fort Willoughby which was constructed during the Napoleonic Wars by the Danish and British. After you browse the grounds of Fort Willoughby you will then take a break for photographs and a snack. When you are finished at Fort Willoughby you will kayak to Careening Cove, ship repair yard and then travel to the 19th-century Creque Marine Railway. Now you will enter the water for some of the best snorkeling opportunities on St. Thomas where you will view a plethora of colorful marine life just of the shore of a white sand beach. An added bonus on this tour is that you will receive a one year membership to the Virgin Islands National Park as well as membership perks on shopping. Your excursion ends with a short 5-minute paddle back to the Frenchtown Marina. When your cruise ship ports and you are searching for a shore excursion in St. Thomas that is perfect for families, then you should try the Coral World Ocean Park. Your general admission ticket to Coral World Ocean Park is the ideal activity for families with over 21 exhibits for you to view and interact with while you visit this extraordinary sea life park. Coral World Ocean Park incudes the Touch Pool where you can handle a hermit crab or sea cucumber; the Undersea Observatory Tower which is 100-feet offshore and allows you to view the marine life from 15-feet underwater; the Shark Shallows is home to nurse, lemon, reef and blacktip sharks; the Stingray Lagoon is a great atmosphere to watch the rays glide around; the Turtle Pool is home to sea turtles and you can learn about nesting as well as eating habits and the Caribbean Reef Encounter is a spectacular look at hundreds of tropical fish and reef animals from around the Caribbean Sea. Your general admission ticket also includes access to Coki Beach where the best snorkeling on St. Thomas can be found as well as a plethora of watersport fun like swimming and waterslides. Your general admission ticket does not include admission to such attractions as Snuba, Sea Lion Swim, Semi-Submarine, Sea Trek and other water-based activities. If you are looking for a family-friendly shore excursion in St. Thomas that includes several water activities, then you should book the Mangrove Lagoon Kayak and Snorkel Tour. Your 2.5-hour excursion has two departure times throughout the day and begins when you meet your expert guide at the marina off of Bovoni Road. After meeting your guide you will be given a short lesson on kayaking before setting out to explore the Mangrove Lagoon Wildlife Sanctuary and Marine Preserve. As you paddle through the sanctuary you will view several small islands as well as incredible bird and marine life. Once you have kayaked around the sanctuary you will then put on your snorkeling mask and enjoy an exclusive guided tour underwater as you view the interesting tropical marine life within the mangrove ecosystem. If that is not enough, you can opt in for a hike too on the pristine island of Cas Cay which is a 15-acre preserve that is home to herons, egrets, brown pelicans, roseate terns and many more species of birds. You will also view an interesting blowhole made from coral which rests at the base of a volcanic cliff. Your two or three activity concludes when you are transported back to the marina on Bovoni Road. When you are searching for the perfect shore excursion in St. Thomas, then you should think about booking the Lindbergh Bay Beach Kayak and Snorkel Tour. Your 3-hour adventure begins with complimentary pickup service from your hotel or cruise ship port where you will be driven to Lindbergh Bay Beach. Once you have met your expert nature guide you will be given a short lesson on kayaking before paddling off. While you paddle you will view incredible marine life like stingrays and sea turtles as well as absorb the scenery of the island from the water. After you reach a more remote white sand beach you will then be fitted with snorkeling equipment and you will follow your guide into the water where you will view fabulous coral reefs as well as colorful tropical fish. 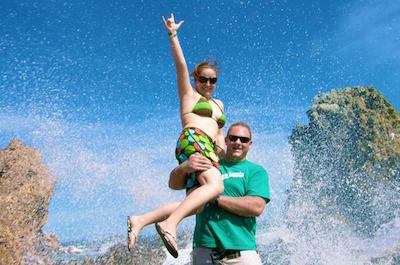 When you are finished snorkeling there are facilities onsite to change and shower as well as enjoy a cold beverage. Your St. Thomas adventure concludes with drop-off service back at your hotel or selected cruise ship port. If you want to have an exciting day of multiple activities, then the best shore excursion in St. Thomas for you is the Reef and Turtle Discovery with Honeymoon Beach. Your 5.5-hour excursion begins with pickup service at your hotel or cruise ship port or you can choose to meet you guide at Lindbergh Bay Beach. Once you meet your guide you will be given a short lesson on how to navigate your kayak before paddling out along the peninsula where your guide will inform you of the ecosystem and the geologic past of St. Thomas. You will have spectacular views of various cays and of St. Thomas as you glide through the crystal clear water. After 45-minutes of kayaking you will land on a white sand beach where you will take a break and be fitted with snorkeling equipment. Now you will venture into the warm waters and snorkel and swim with numerous sea turtles which are close to the shoreline. Once you have snorkeled for 45-minutes you will return to the beach and enjoy a complimentary lunch. From lunch you will experience the final portion of your shore excursion in St. Thomas which is to snorkel around an incredible coral reef with an abundance of marine life. After you paddle back 30-minutes to Lindbergh Bay Beach, you will be transported back to your cruise ship pier or hotel.